Somehow your dog seems to know when it's time to get his pill, and no amount of coaxing will get him out from under the bed. Let GREENIES help. 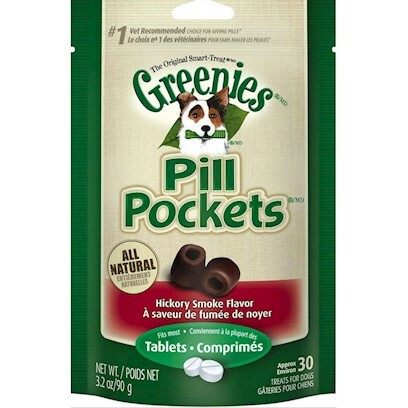 GREENIES PILL POCKETS are the #1 veterinarian-recommended choice for giving pills. Your pet will love the hickory smoked beef flavor so much, they won't even realize they're taking their medication! Made with real chicken or beef, the treats are a nutritious and healthier alternative to the commonly used human foods (cheese, peanut butter, tuna)-and a lot less messy. They also contain vitamins C and E to promote a healthy immune system. No more dreading pill time...for you or your pet.